Starting 1-2 inches down on the orange, slice off the top and set aside. 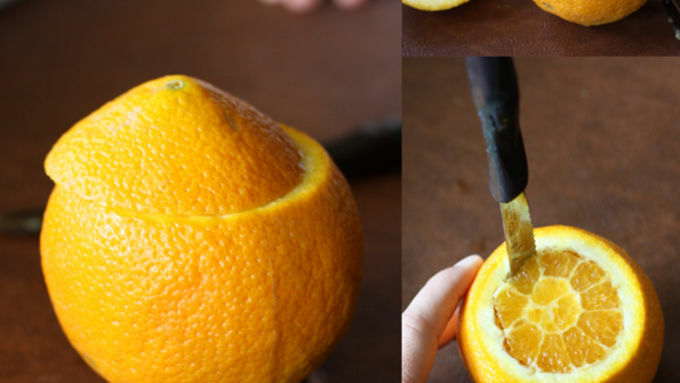 Using a knife cut around the edge of the flesh of the orange and hollow out the orange with a spoon. Use the orange flesh for some other use. Repeat with the other remaining oranges. Prepare the brownie batter according to package directions. 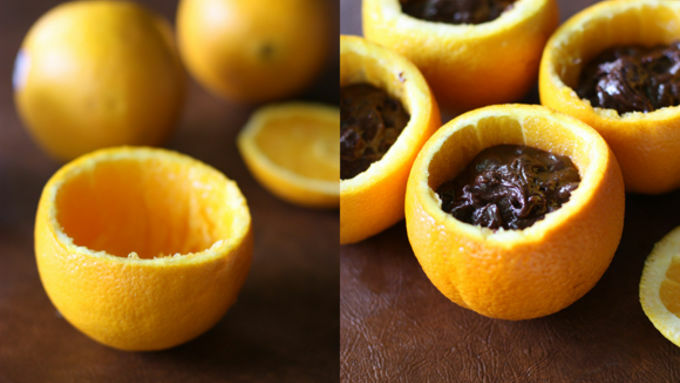 Fill each orange with the brownie batter about an inch below the top of the orange and cover with the orange top. Wrap in heavy duty foil with at least 2 layers of foil. Cook cakes in some campfire coals, rotating every once in awhile for 30-50 minutes depending on how hot your fire is. Unwrap cake and top with crushed Frosted Toast Crunch™. Drizzle with caramel sauce if desired. 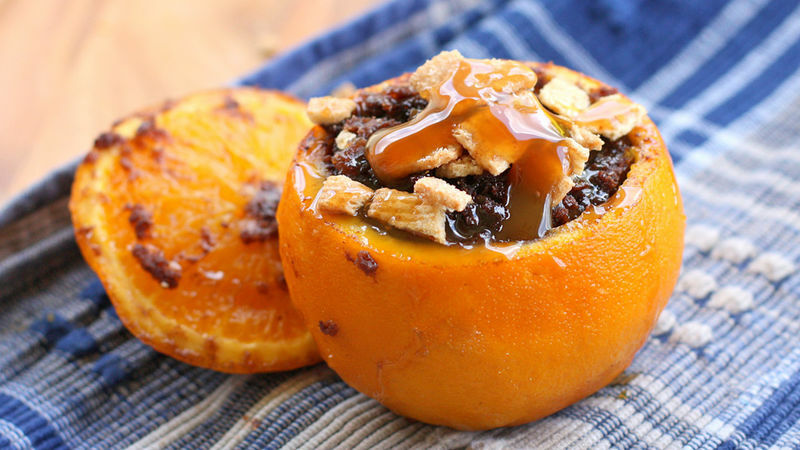 Fudgy brownie cakes baked inside an orange -- in the campfire! Camping desserts don't get any better! 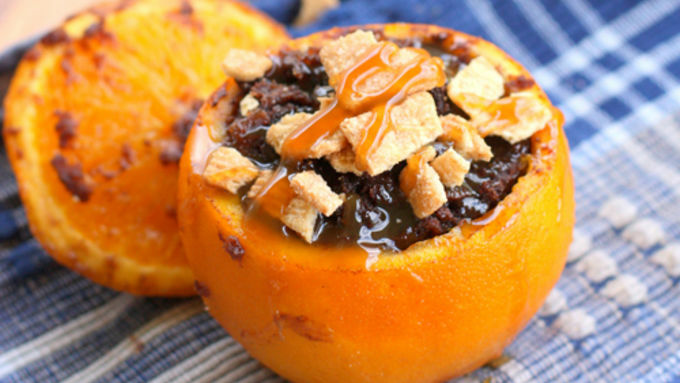 You don’t have to skip dessert just because you’re camping. In fact, these fabulously fudgy Campfire Cakes were designed to be baked and enjoyed while gathered around your campfire. 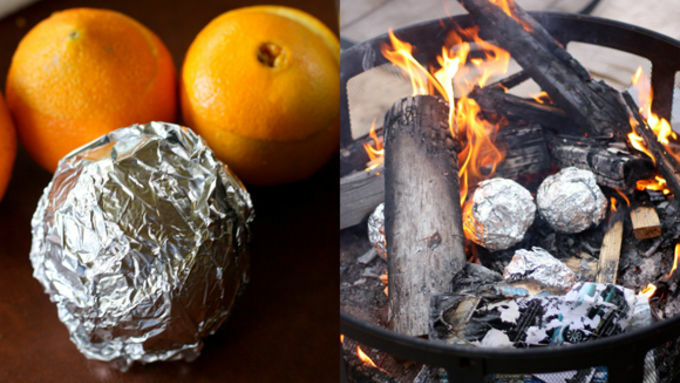 Oranges just happen to be the perfectly sized natural containers to make our Campfire Cakes in. And if you love chocolate with a hint of orange, then that’s just what these cakes are. Start by slicing off the top of each orange and hollowing out the inside. You can make some orange juice or eat the orange slices by themselves, but we aren’t actually going to add the flesh of the orange to the cake batter. That could be a wet mess. You want to fill them a good inch under the brim of the orange keeping in mind that they will expand as they bake. Put the top of the orange back on and wrap it up at least twice with some heavy duty foil. The outside of the orange might get a little black, which is not a problem, but you don’t want the entire thing completely scorched. When your fire has some nice toasty coals going, toss in the Campfire Cakes, making sure to rotate them around every once in a while to cook all sides. After about a half hour, depending how hot your fire is, your cakes will be ready to eat as you tell stories around the fire. You can add some crushed up Frosted Toast Crunch cereal on top for some graham cracker flavored crunch and drizzled some caramel sauce all over. Dress ‘em up or eat them plain but either way these Campfire Cakes are a creative and cute way to enjoy dessert while you are camping under the stars.